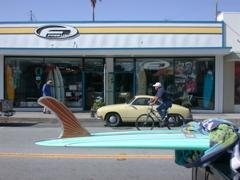 Santa Cruz is the spot that features our latest dealer of PaddleAir Ergo: None other than legendary shaper John Mel's Freeline Design Surf Shop. Freeline has been a Santa Cruz institution since 1969 and has a well-established reputation in the Northern California surf scene. or like them on Facebook or Twitter. The shop is located at 821 41st Ave. Santa Cruz, California 95062. The Mels' are a true California surfing family. John is the father of the current 2012/2013 Mavericks Invitational Surfing Champion and Big Wave World Tour Champion, Peter Mel. In turn, Peter's son, John, is a burgeoning junior surfing champion. An article from the Santa Cruz Sentinel highlights the family's surfing competitiveness: "On the Day Peter Mel Won Mavericks, His Father and Son Were Also Competing." See videos of the surfing family check out The John Mel Surf Channel.